Uusi started their sixth and final playing card project on Kickstarter. Creators of Blue Blood, Blueblood Redux (2nd edition of Blue Blood), Bohemia, Royal Optik, Pagan and Hotcakes Playing Cards, Peter and Linnea traditionally propose an entirely hand-painted deck of playing cards called “Uusi Classic”, the last deck in Uusi’s Six-Deck Series. There will be two decks with the same faces of cards and different colours of backs, Uusi Classic Blue and Uusi Classic Red decks. 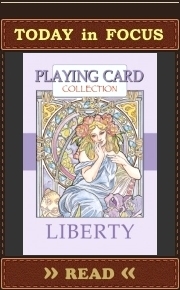 These decks are planned to be printed by the United States Playing Card Company (USPCC). Peter Dunham and Linnea Gits, the designers and artists behind the Chicago design studio, Uusi, started their new playing card project on Kickstarter. 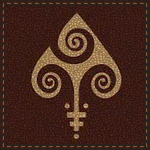 One of the most creative, successful and decent companies proposes its fourth duet of decks – Pagan Playing Card Decks (“Dark Brown Deck” and “Light Cream-colored Deck”). 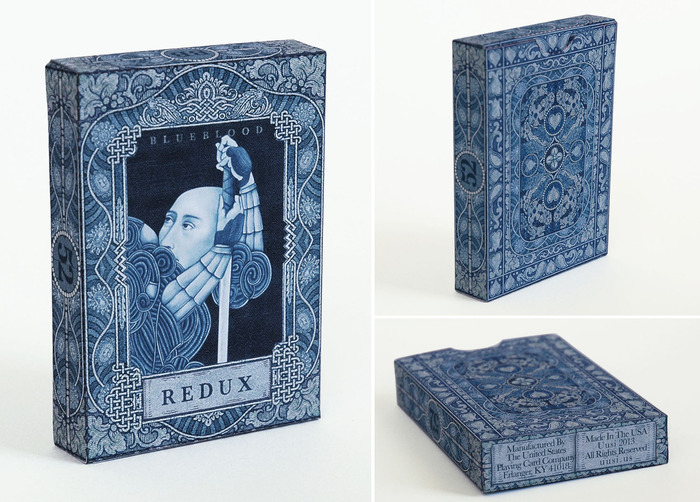 All previous amazing playing card projects (Blue Blood Playing Cards and Blueblood Redux Playing Cards, Bohemia Playing Cards, Royal Optik Playing Cards) have been successfully funded on Kickstarter, printed and delivered to backers. 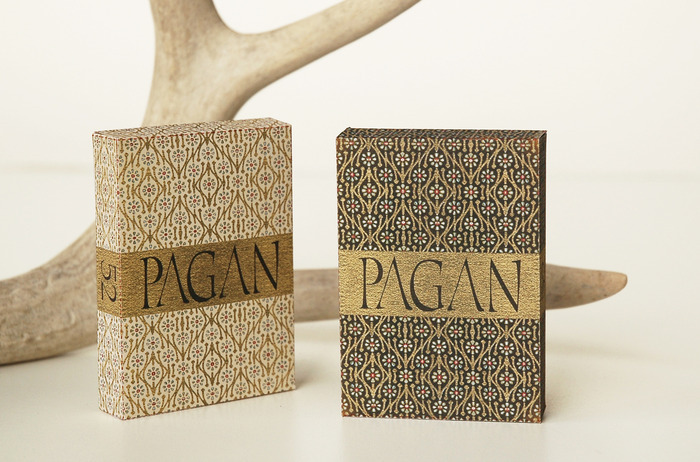 Pagan deck is planned to be printed by USPCC. 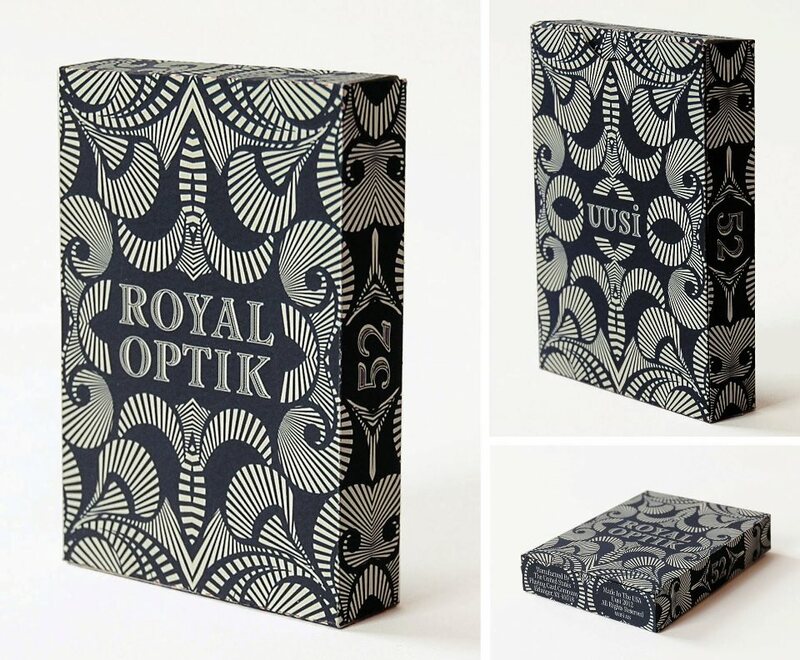 The 1st Edition of Blue Blood Playing Cards designed by Uusi (Bohemia, Royal Optik Playing Cards) became a collectable item. So they decided to produce the second edition in this series with some interesting changes. These changes make it interesting even for owners of the first edition. The deck is planned to be printed by USPCC. Two artistic styles – Op Art and Woodcut – come together to create one completely original playing card deck. Uusi (Blue Blood, Bohemia Playing Cards) started its third playing card project on Kickstarter. The deck will be printed by USPCC on Bicycle playing card stock with an Air Cushion Finish. Street art meets Baroque in this luminous, hand-painted deck. A juicy mix of risk and art, “Bohemia” is a Limited Edition Original. 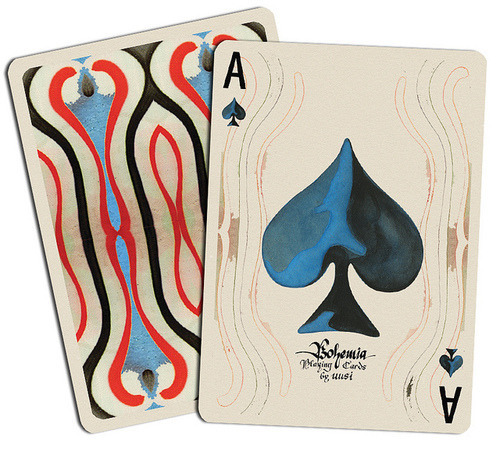 Bohemia – an entirely hand-painted and hand-lettered playing card deck. Bohemia is the second limited-edition Uusi deck in a planned six-deck series. The artwork for Bohemia was inspired by the unlikely pairing of 17th-century Baroque style with contemporary, urban street art. Each have a flair for drama, tension and grandeur that when mixed together create one lush,combustible style! This deck is perfect for your neighborhood or family poker game, a few heated rounds of gin rummy, spades or hearts with friends or simply to add a little drama to your favorite game of solitaire. In the skilled hands of a magician or flourisher, our deck’s colorful card backs and custom face designs become a dazzling display of hypnotic, moving color and beauty. 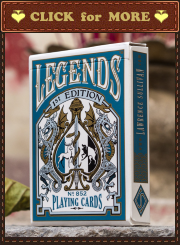 For the collector, it is a true original with an attractive, unique tuck box and made in limited quantities. Fifty-two playing cards and two jokers, all with unique art that’s executed in the traditional “Anglo-Rouen” design pattern, ideal for magic and card games due to being unique and eye-catching, yet at the same time very familiar and immediately recognizable by players and spectators alike. Completely hand-painted with gouache paint for the illustrations on every single card, right down to the pips and indices. One blank-faced card with the same background pattern that’s repeated on all the faces, suitable for use as a cut card, a magician’s gaff or a replacement for a damaged card. One illustrated Uusi Design ad card. Printed by the United States Playing Card Company (USPC) in a run of 3500 decks. Made on Bicycle playing card stock with an Air Cushion Finish for a glide that’s easy and smooth without being too slick and slippery.